Harvey Nearing Landfall. Greatest Impacts Expected West of Acadiana. 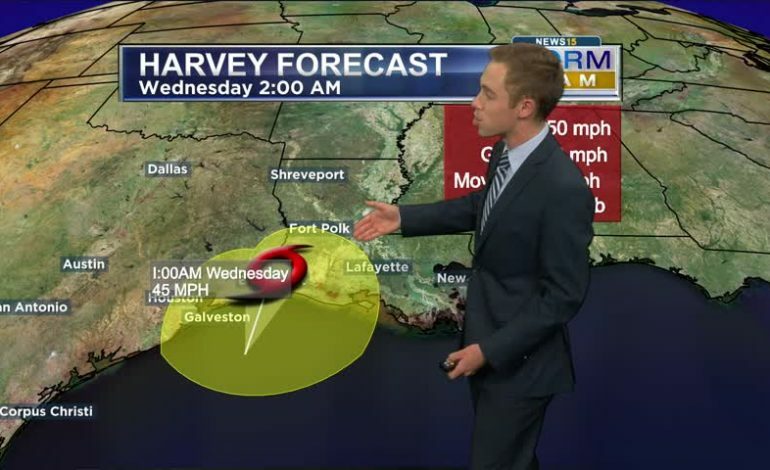 Latest 1AM Advisory from the National Hurricane Center: Tropical Storm Harvey has weakened slightly with maximum sustained winds of 45mph and gusts of 55mph. Winds across Acadiana & southwest Louisiana continue to gust 15-35mph. Strongest wind gusts remain offshore of 35-50mph. At this point(similar to Tropical Storm Cindy in June), the most significant rain is located either hundreds of miles east of the center or located in the northwestern quadrant of the system. “Dry Slot” of lower atmospheric moisture continues to lessen our flash flood concerns across Eastern Acadiana currently. Here’s more good news for most of Acadiana. High-resolution models continue to trend downward for expected rainfall totals across the area, as the mid-upper level dry air being ingested into Harvey’s circulation continues to zap the overall thunderstorm development on the eastern side of the system! Heaviest rain continues to move into southwest Louisiana in Calcasieu, Cameron, and Beauregard Parishes. Most of Acadiana is only seeing intermittent light to moderate rain at this time. If that stout dry air keeps entangling itself in Harvey’s circulation, the sun may even shine tomorrow in portions of Acadiana tomorrow afternoon! WIND ADVISORY: Issued for all of Acadiana that isn’t located within a Tropical Storm Warning through 7PM tomorrow evening. Wind Advisories have also been issued for a large chunk of southeast Louisiana & Central Louisiana. This means wind gusts above tropical storm force will be possible. Primary wind threat of wind gusts of 25-45mph overnight tonight through tomorrow afternoon. Difficult driving conditions for high profile vehicles, especially on elevated roadways. Loose lawn objects along with trash cans will be blown around. Small tree limbs broken. TROPICAL STORM WARNINGS: Include Calcasieu, Cameron, Vermilion, Iberia, Jeff Davis, St Mary, Lower St Martin, Lower Assumption, Terrebonne, and Lafourche Parishes. All of the parishes shaded in dark blue can expect a primary wind threat of sustained winds of 25-40mph with localized gusts of 40-55mph. Sporadic power outages possible. STORM SURGE WARNING: Issued from the Louisiana/Texas state line to Morgan City. This means coastal flooding of 2-3 with localized 4 feet likely today & Wednesday, especially during high tide as onshore wind flow will allow coastal tides to rise. Keep this in mind if you live in a flood-prone location near the coast. By Friday into the weekend…our weather pattern should begin to quiet down slightly with high temperatures slowly creeping back up into the mid-upper 80s. But, a few forecast models still indicate a sufficient amount of tropical moisture will linger around the area. That will create the possibility for daily showers and thunderstorms continuing. A vigorous tropical wave dubbed Invest 93L in the East Atlantic near the Cabo Verde Islands by western Africa has a high(90% ) chance of becoming a tropical depression or Tropical Storm Irma within the next 3-5 days. Most models showcase this system moving steadily westward over the next 5 days, moving north of the Lesser Antilles in about 6-8 days. This system may be a threat to the U.S. in the long range, but it’s still 12-14 days away from ever reaching it. Something to monitor for now. A few forecast models also indicate we also should keep an eye on the Bay of Campeche and the western Gulf of Mexico over the next 5-7 days for possible tropical development. Nothing imminent, but it is something to keep an eye on!